Take, for instance, the famous “Cups & Balls” routine. Mario lines up the three cups in a row and tells the audience that Houdini used to throw one of the three balls into the audience; whoever caught it would be his assistant. The kids wiggle into their best catching positions, holding their breath in anticipation...while Mario…proceeds to do nothing. “I am not Houdini!” he proclaims proudly. At the end of the routine, Mario reveals under the cups three tiny, 3D-printed, Arduino-powered robots performing random servo movements! Mario Marchese, 37, lives with his wife, Katie, and two young children, Gigi and Bear, in Nyack, New York. 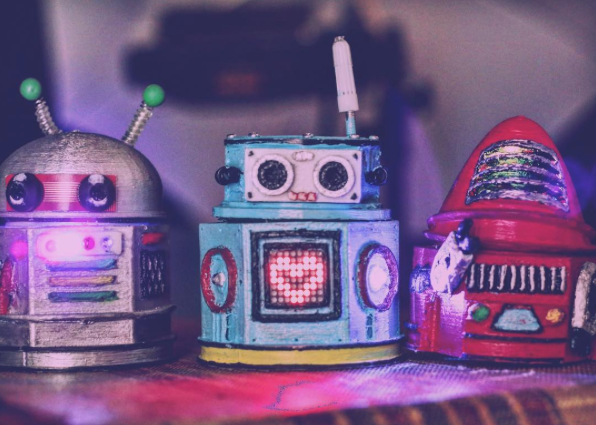 His interest in programming was sparked about a decade ago when he picked up an issue of Make: magazine featuring a beginner’s guide to Arduino. He followed a Make: tutorial to build a cigar-box guitar and later made his own cigar-box amp. He also started making electronic art pieces that interpreted sound from their surroundings and autonomously created drawings based on those sounds. His drawing machines appeared in a few gallery shows in and around New York City, but it wasn’t long before Mario realized he could use the skills he was honing to amp up his magic career. 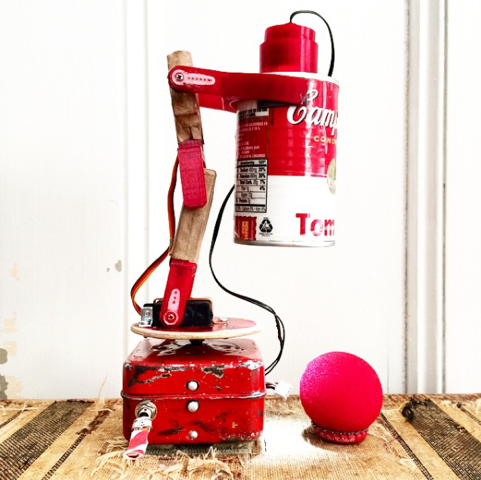 Mr. Lamp, the Robotic Lamp, is one of Mario’s star robots, built out of a flexible Pixaresque standing lamp, a Campbell’s soup can and SparkFun’s smallest Arduino-compatible board, the Pro Micro. Mario has programmed Mr. Lamp to follow the position of a red ball and guess, by way of a nod yes or no, which hand it’s in. But his best trick is playing dead. In fact, this charming mechanical thespian’s exit is so dramatic that the audience truly starts to worry, especially when Mario begins to administer CPR. There’s a sigh of relief when the bot is brought back — and then dismembered to show the audience how it’s made. In culmination, Mario makes the soup can disappear and then magically pop out of his top hat. “They fall apart on purpose,” Mario says. Case in point: a trick suitcase composed of some 18 servos, all mounted with hot glue and masking tape. Using an Arduino Mega and hidden magnets, he makes flowers and flags pop up out of the suitcase…all well and good until everything goes haywire. In the end, a spring snake shoots out at Mario, all the flowers and flags fall down, and the suitcase, which obviously has a mind of its own, slams shut. 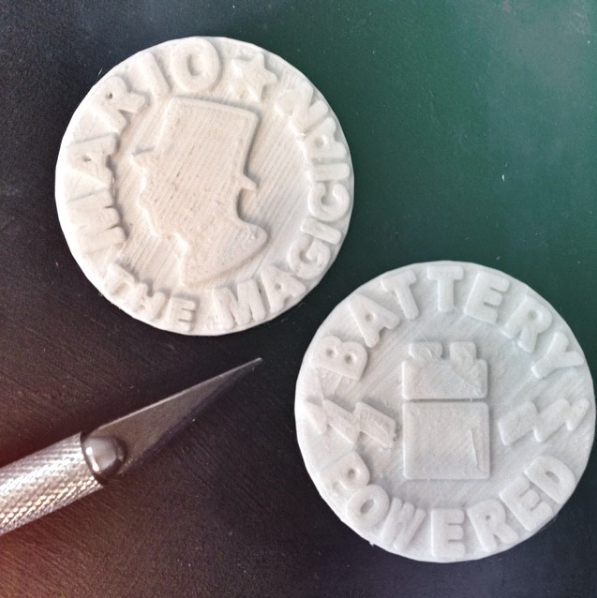 There’s no doubt this “maker magician” practices what he preaches. He makes his props from anything and everything. 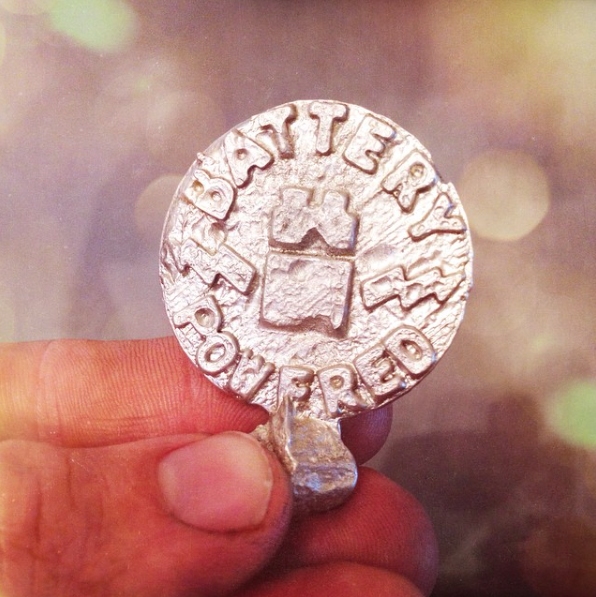 He gives himself a grand introduction by revealing two pizza boxes proclaiming him “World’s Greatest Magician.” He designed and 3D printed molds to cast his own pewter “Mario” coins, which he pulls from thin air or a volunteer’s ear, nose or even armpit before dropping them with a clink into an antique animal crackers tin. 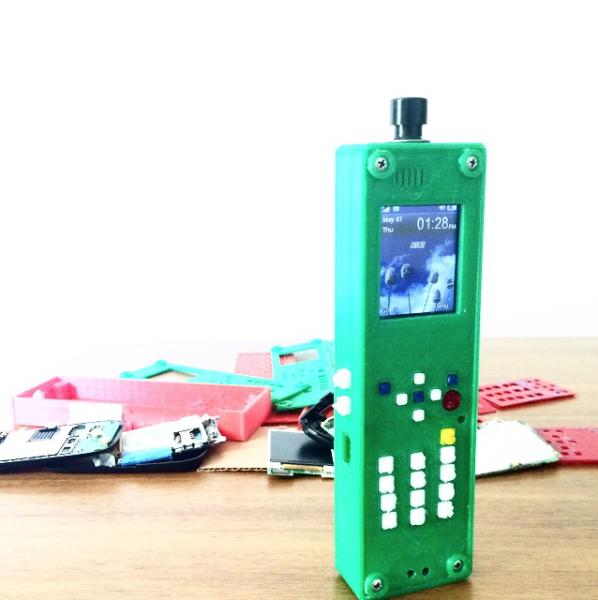 He removed the guts from an old flip phone and designed and 3D printed a new casing and buttons, resoldering all of the electronic connections to work with a gag where he pretends to take pictures in the spirit of Inspector Gadget. And his true masterpiece is a vintage cymbal-playing monkey doll he gave a makeover and named Marcel. Mario has long been a craftsman and once carved more than a dozen wooden marionettes, even sewing their clothes. But the real magic, he found, is bringing a doll to life…with the help of a little RedBoard. Remember the ball trick? Marcel the Monkey gets a chance to play too! His task is to place the ball in the cup after three minutes of comedic insubordination behind Mario’s back. Much to the audience’s delight, Marcel mocks Mario when he’s not looking, knocks things over and claps when he’s not supposed to. If the audience makes enough noise, Marcel responds to the sound by beating his chest. 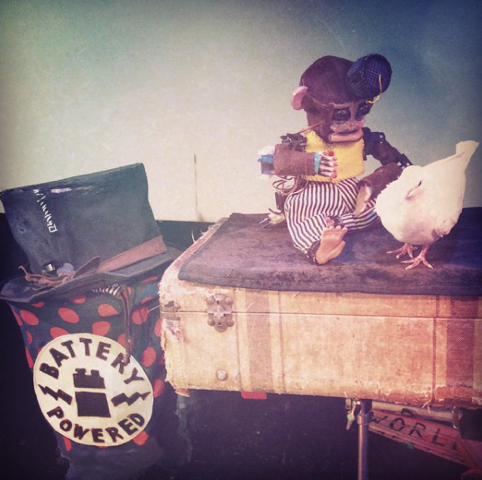 Mario isn’t the only one who thinks Marcel is special; he brags that the mechanical monkey won four Editor’s Choice awards and a Best in Class at the 2016 World Maker Faire® in New York City. The magician jokes that he, on the other hand, has to make his own awards, as evidenced by the bottle cap ribbon he wears on his chest. 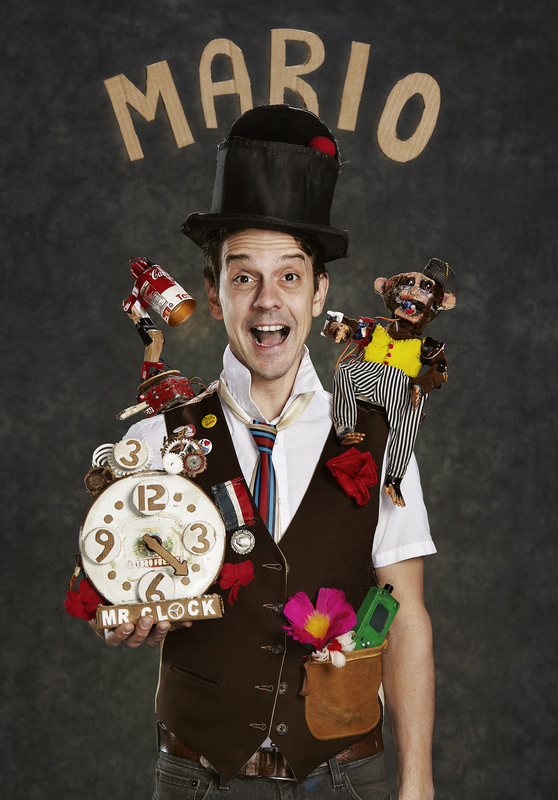 Mario completed his own national tour this summer (#itsafamilybusiness) and is preparing to perform again at this year's World Maker Faire in New York, “the Greatest Show (& Tell) on Earth,” on Sept. 23. Then it’s off to Maker Faire Shenzhen, China, in November! Follow Mario on YouTube at #mymagicfamily, Instagram and Facebook @mariothemagician, or Twitter @mariomagician. In Mario’s words, “making is like unraveling the secrets of the universe.” Want to try making magic yourself? Make Mario’s magic flower lapel. If you’re in the NYC area, catch Mario’s Maker Faire show at 11 a.m. on Saturday, Sept. 23. If you’re in or around Colorado, don’t miss SparkFun’s annual Autonomous Vehicle Competition (AVC) at Maker Faire Denver, Oct. 14–15. Innovation is key to success.